LANSING, Mich. (AP) — Democratic Gov. 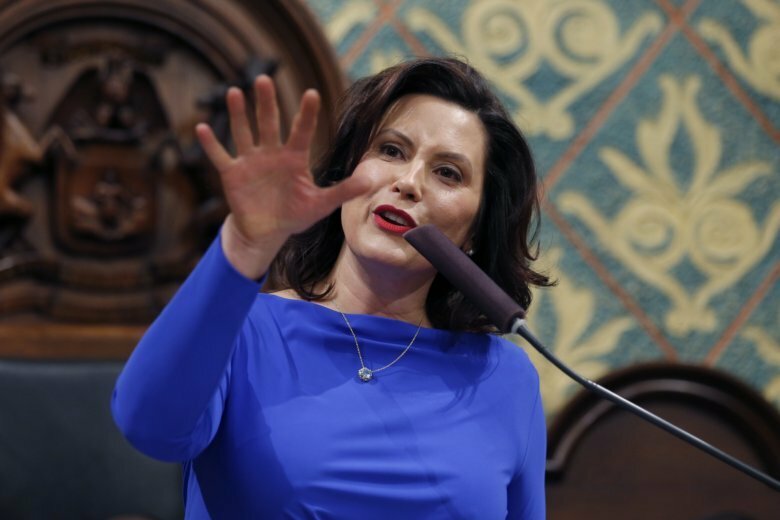 Gretchen Whitmer on Tuesday defended her proposal to nearly triple Michigan’s per-gallon gasoline tax to make it the highest in the nation, promising no more “shell games” or “half measures” to reverse the deteriorating condition of the roads. The $2.1 billion plan would increase the 26-cent fuel tax by 45 cents between this October and October 2020 and guarantee that the additional revenue is targeted to more heavily traveled roads. To alleviate the burden for some motorists, she proposed a tax overhaul under which retirees and low-income earners would get breaks while more businesses would pay a 6 percent tax instead of the lower 4.25 percent personal income tax. The proposal is an attempt to reverse parts of a tax rewrite enacted by her Republican predecessor, Rick Snyder. Her road-funding plan is expected to face resistance in the Republican-controlled Legislature, which passed fuel and vehicle registration tax hikes that took effect in 2017 but have been criticized for not generating nearly enough revenue under laws that also shifted spending from other budget priorities. Critics said the tax hikes only slowed the decline of road conditions. States across the nation are struggling with how to finance road maintenance and construction as vehicles become more fuel-efficient and generate less revenue from flat per-gallon taxes. New Ohio Gov. Mike DeWine, a Republican, is seeking an 18-cent gas tax increase . “How can you explain a 45-cent tax increase today?” Rep. Matt Maddock asked Whitmer’s budget director after pointing to her debate comments. The conservative Michigan Freedom Fund accused Whitmer of lying on the campaign trail. Whitmer said it was not always her plan to seek so large of a tax hike, but once she took office she gained a “real appreciation” for how quickly the nation’s worst roads are deteriorating. Whitmer said her proposal would cost the average driver $23 a month, or $276 a year, but contended that motorists already are paying a “roads tax” for vehicle repairs caused by crumbling infrastructure. She proposed doubling the earned income tax credit for low-income residents, saving 750,000 families $30 a month, and repealing the so-called retirement tax on pension and other income — saving 400,000 households $65 per month. Michigan now has the 9th-highest combined local, state and federal gas taxes in the U.S., according to the American Petroleum Institute. Under Whitmer’s plan, it would have the highest taxes, easily surpassing states like Pennsylvania and California. Michigan is among a small number of states to apply the sales tax to motor fuel, but that revenue mostly goes to schools and local governments under the state constitution. In response to Whitmer’s proposal, Republican House Speaker Lee Chatfield renewed his call for ensuring that “every penny” paid at the pump is devoted to roadwork. “We can’t continue to gloss over the long-term structural problem, while asking families, workers and seniors who are already living paycheck to paycheck to pay even more,” he said in a statement. Whitmer did propose no longer diverting hundreds of millions in general funds to the transportation budget, saying it should go to universities. She also outlined a $507 million boost in K-12 spending for the next fiscal year, including extra funding to teach at-risk, special education, and career and technical students. She also wants to make more 4-year-olds eligible for publicly-funded preschool.